Free Shipping Included! H Potter Tall Outdoor Indoor Planter Patio Deck Flower Ribbed Garden Planters Antique Copper Finish (LARGE) by H Potter at Tulips Orchids. MPN: GAR546 LARGE. Hurry! Limited time offer. Offer valid only while supplies last. Hand-crafted, ribbed, stainless steel planter with antique copper finish. Large is Approximately 13 inches square at top by 35 inches high. 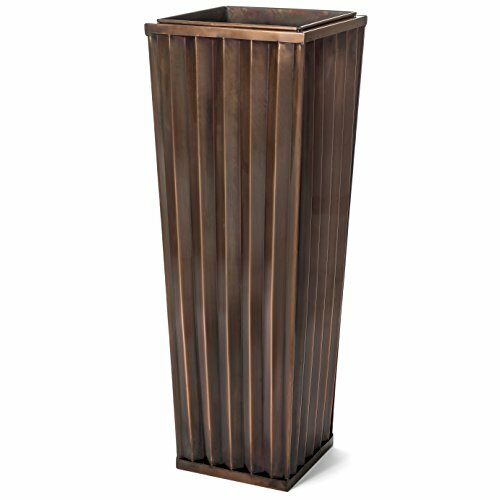 Hand-crafted, ribbed, stainless steel planter with antique copper finish. Large is Approximately 13 inches square at top by 35 inches high. Approximately 10 inches square at base of planter. Small is Approximately 11 inches wide at the top Approximately 8 inches wide at the bottom and Approximately 29 inches high. Includes metal liner insert. The insert allows you to fill only they top of the planter with dirt. If you find this makes the planter top-heavy you might choose to place weight in the bottom of the planter. Designed and Manufactured by H Potter.